LANCASTER, CA - The Lancaster JetHawks, class A affiliate of the Houston Astros, are proud to announce that it has reached agreement with LoanMart, a Southern California-based company, on a two-year Presenting Sponsorship of the professional baseball club. The multi-year partnership marks the first time in the 18-year history of the franchise that the JetHawks will have a corporate partner in this category. The agreement continues LoanMart's involvement with the JetHawks, which began in 2012, and included last season's Presenting Sponsorship of the JetHawks' historic post-season in which the organization captured its first-ever California League championship. "We are thrilled to have LoanMart as the JetHawks' first Presenting sponsor in franchise history and to work closely with a company that shares a common, creative approach to growing its business," explained JetHawks Vice President Brad Seymour. "Coming on the heels of our first championship and a season in which attendance and revenues grew for our company, this partnership is an excellent way to begin building on our successes that we experienced on and off the field." The Presenting Sponsorship will include significant in-stadium branding as well as title sponsorship of four promotional giveaways items, including a Replica Championship Ring Giveaway and Military Appreciation Jersey Giveaway, and two fireworks shows, including the JetHawks signature Independence Day celebration. LoanMart will also be featured as the title sponsor of The Pilot's Lounge, the private party room located on the luxury suite level of The Hangar. Purchase Your Ticket Package TODAY. "We're excited to be part of the 2013 season as the JetHawks defend their California League Championship. We look forward to working with the club in many promotions in-stadium and through social media to get the fans the best baseball experience possible. Go JetHawks!" said LoanMart's Marketing Director, Colby Estes. A custom Presenting Sponsorship logo that features LoanMart's brand will be featured on all JetHawks' print materials, including official club stationary and game tickets, and prominently positioned on the team's website. 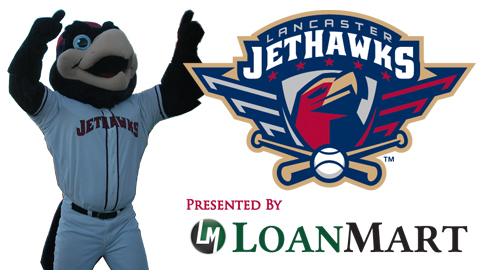 "The Lancaster JetHawks, presented by LoanMart" will also be heard in all advertising placed by the JetHawks in the Antelope Valley. To commemorate the exciting partnership, a Community Open House at The Hangar will take place this Saturday, February 16 from 11am to 2pm. The free event will feature giveaways of a limited number of commemorative Presenting Sponsorship t-shirts and many other promotional giveaways. Attendees will also have the opportunity to take batting practice on the field, enjoy free use of the JetHawks Fun Zone inflatables and partake in a complimentary ballpark lunch. About LoanMart: LoanMart is a direct lender specializing in non-traditional loans for customers who may otherwise be unable to borrow money from traditional sources such as banks. Their lending products include auto equity loans and signature loans and are available regardless of applicants' credit score. Based in Encino, Calif., LoanMart has over 250 employees, and currently does business in California, Arizona, New Mexico, Utah, Illinois, and Missouri. For more information about LoanMart, please visit the company's website at www.Loanmart.com. About Lancaster JetHawks: The Lancaster JetHawks enter its 18th season in the California League and fifth as an affiliate of the Houston Astros. The team plays its home games at The Hangar in Lancaster, CA. The information contained in LoanMart's press releases is intended solely for journalists and should not be used by consumers to make financial decisions. Any consumer interested in finding out more about any of LoanMart's services should visit http://www.Loanmart.com for full terms and conditions.